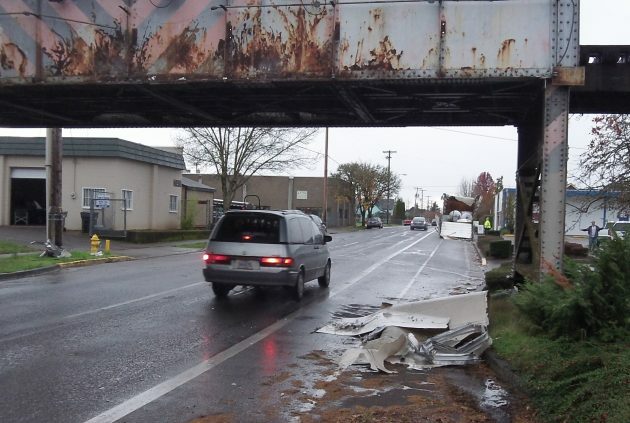 Albany has started upgrading the signage that’s supposed to keep drivers of tall trucks from ramming their rigs into the Lafayette Street trestle on First Avenue. Brighter blinking lights are part of the work. I was riding my bike west on First the other day when, for the first time, I noticed flashing warning lights on both sides of the driving lanes just past Hill Street, two blocks ahead of the trestle. Why didn’t I remember seeing those lights and big detour signs before? Had they always been there and I just didn’t notice? Or were they new? A few weeks ago, city officials had announced they planned to take steps to try to prevent truck collisions at the trestle, which has a posted clearance of 11 feet 4 inches. Crashes have happened there many times over the years and seem to have become more frequent in recent times, even though detour signs for trucks are in place, along with a set of warning chains dangling above the street and slowly blinking lights on the railroad bridge itself. As usual, I asked the people I was sure had the answers. A file shot of the trestle after a crash in November 2014. I didn’t know it had a name, let alone “The Truck Eater”, but it is definitely well named. I drive through every day coming home from work, and honestly I notice the signs every time. It truly amazes me that you could miss them, and even think that you could get a big rig through. The warnings are everywhere. Great story! Can’t we just install a video camera that start a facebook live feed anytime a truck hits the drag chains, and call it good? Just returned from “downtown” and in doing so drove down First. Yep the flashing lights that the City put in are still there and working well but the ones on the trestle (PNW responsibility??) are still very dim and the two in the center are burned out. Being pointed in pretty much of a downward position doesn’t make seeing them any better. Does anyone know how to contact the railroad to report to them??? Once again, Albany Public Works leads the way in showing how government gets things done. Now, if only the City Council could learn from Public Works and move the recreational marijuana issue forward.